NETWORK UPDATE: On CBS, THE BIG BANG THEORY gained 0.1 in final numbers and both LIFE IN PIECES and SCORPION lost the same. THE VOICE also gained 0.1 and CASTLE lost the same. 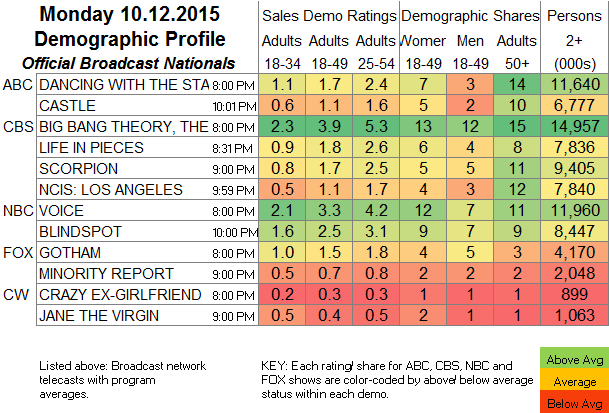 An additional note: JANE THE VIRGIN just missed rounding up to a 0.5 adult 18-49 rating. Taken out several decimal places, it came in with a 0.449144 rating. A few more ten-thousandths of a rating point and it would have clicked over to 0.450000, which would become a 0.5 rating, in the clunky tenth of a rating point nomenclature. CABLE HIGHLIGHTS: ESPN’s MONDAY NIGHT FOOTBALL was on top of course, albeit down 0.72 from last week to 4.48. Both of TBS’s MLB PLAYOFFS games were in the Top 5, Cubs/Cardinals at 1.68 and Mets/Dodgers at 1.22., while Fox Sports 1’s games were at 0.55 (Kansas City/Houston) and 0.53 (Toronto/Texas). On VH1, LOVE & HIP-HOP was up 0.02 to 1.43, BLACK INK CREW dropped 0.09 to 1.11, and SHE’S GOT GAME was off by 0.04 to 0.90. USA’s WWE coverage was at 1.16-1.06 over its 3 hours, compared to 1.13-1.12 last week. Bravo’s REAL HOUSEWIVES OF ORANGE COUNTY climbed 0.12 to 0.87, and LADIES OF LONDON was up 0.07 to 0.36. Discovery’s FAST N LOUD lost 0.05 to 0.79, and RUSTED DEVELOPMENT fell 0.12 to 0.34. On FX, FARGO returned at 0.48, well below its 0.8 start in 2014, although closer to its 0.61 finale. 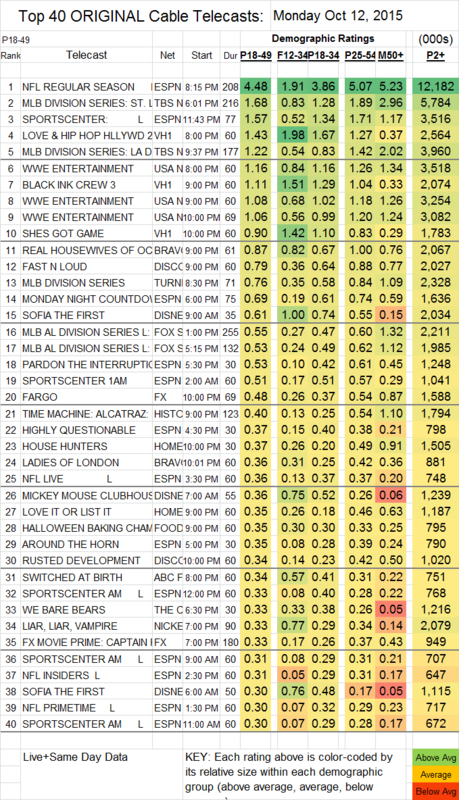 On ABCFamily, SWITCHED AT BIRTH was down 0.02 to 0.34 (but up a tick in the F12-34 demo to 0.57). On MTV, AWKWARD dropped 0.04 to 0.28, FAKING IT ticked up to 0.20, TODRICK gained 0.02 to 0.09, and GIRL CODE LIVE fell 0.01 to 0.08 (177K total viewers).